Amid the physical damage caused by Hurricane Florence were thousands of people in Eastern North Carolina who lost access to the most basic—yet essential—needs, many of whom turned to local food banks for help. The Food Bank of Central & Eastern North Carolina (Food Bank CENC) plays a major role in the daily lives of many North Carolinians, especially when it comes to disaster recovery. Food Bank CENC serves 34 counties, and, since its inception, has distributed more than 236 million pounds of food. None of this would be possible without the help of dedicated volunteers willing to lend a helping hand to fellow North Carolinians. As such, in the aftermath of Hurricane Florence, Balentine’s Raleigh team dedicated an afternoon to supporting these efforts. Prior to serving with Food Bank CENC, none of us fully understood the myriad steps required for mass food distribution. We quickly learned that manpower is just as important as the donations themselves. Food Bank CENC receives thousands of pounds of food each day—during our visit alone, it received 10,000 pounds of Cheez-Its from a generous donor. Food and other essentials arrive in large, unsorted crates. Our job was to organize the contents of these crates into categories, such as vegetables, fruits, cereals, etc. While doing so, we inspected each item to make sure only sealed, non-contaminated items were distributed. As a result of this categorization, another team of volunteers was able to efficiently box up well-proportioned meals. From there, a different team labeled each box with its contents to avoid food allergy contamination. Finally, the boxes were ready to be packed into trucks and shipped out. 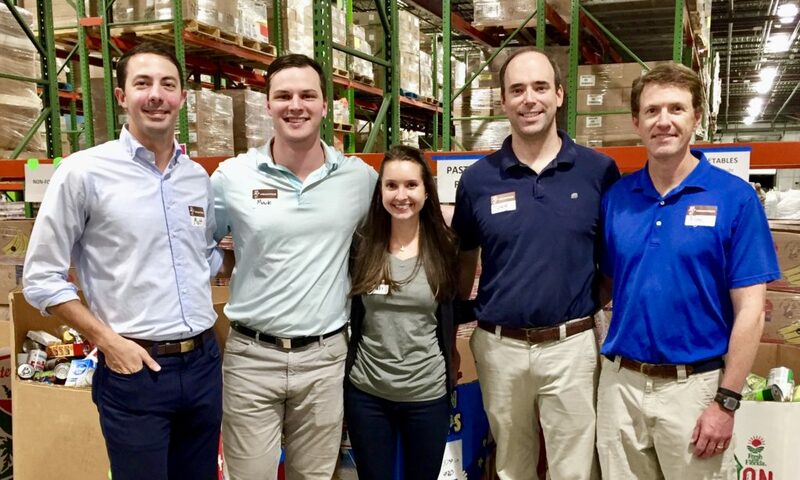 Working in the warehouse taught us what goes on behind the scenes of feeding our communities—in particular, how many hours and hands are required to get meals out. Our biggest takeaway from this experience was how important it is to sort your donations. Instead of throwing a bunch of items into a bag, taking just a couple minutes to categorize your donations can greatly increase warehouse efficiency, whether at Food Bank CENC or your local food bank.